Group founder Jeff Mangum has played a handful of solo shows over the past few years, including festival appearances and a performance at Occupy Wall Street, while Neutral Milk Hotel remained on a hiatus started after they finished touring behind their landmark 1998 LP, In the Aeroplane Over the Sea. This touring lineup will feature Mangum, Scott Spillane, Julian Koster and Jeremy Barnes, the group that began playing together after the 1996 release of On Avery Island. 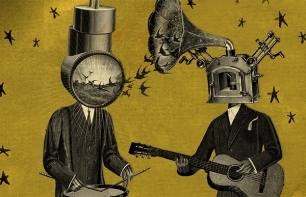 Tickets for Neutral Milk Hotel's two 40 Watt Club gigs go on sale on May 3rd at 10 a.m. EST; no word yet on when tickets for the Asheville show will be on sale. A portion of proceeds from the shows will go to benefit Children of the Blue Sky and others in need.